As the name suggests Fire Horse for a theme has horses. Horses on fire is not something you get to see in everyday life, unless you are watching some action movie, so the name and theme probably come from some Indian legend from the wild west. The animations and symbol details are on a decent level and the background music doesn’t get boring after longer sessions. When you see all the features this game has nothing else will matter except seeing a herd of these creatures flame up the reels and award incredible coin prizes. The developers behind this game are IGT software. Experienced players will recognize the overall game design which is common to a few more other games from this provider including the ultra popular jackpot Siberian Storm. This software provider has some really great games and Fire Horse is no exception. We hope to see many more from them in the future and we hope they will keep up the same quality. Fire Horse doesn’t have any pay lines available and features the Multiway Xtra design. This means that the symbols are distributed over 5 reels which have the 3, 4, 5, 4, 3 rows design. This allows for 720 ways to win and symbols pay both ways, from left to right and right to left. The minimum bet is set at $0.50 while the maximum can go up to $1,500 on some versions of the game. From the bonus features Fire Horse has stacked wilds, stacked bonus symbols, stacked regular symbols and a free spins bonus round. The stacked regular and bonus symbols can come across all reels while the stacked wilds can land only on reels 2, 3 and 4. This makes big wins possible during base play and in the bonus round. The free spins bonus is triggered by landing 5 bonus symbols across all reels, one on each reel. This awards 8 initial free spins with the chance for a retrigger. Triggering the bonus round this way may seem hard, but you’ll be surprised how easy it comes when the game is in a paying mood. The bonus symbols can come stacked and rarely come in sets of only 5. This way the initial number of free spins is much bigger and can go up to 96 in the triggering spin. In the bonus round the free spins can be retriggered several times up to a maximum of 240. Video slot games by IGT are known to produce a big number of retriggers and that is one of the main reasons why they can payout big. The maximum payout promoted in this game is capped at 25,000,000 coins. This is an incredible amount of coins but can happen only in theory if you trigger the bonus with the maximum number of spins, get the maximum number of retrigger and all spins are filled with the highest paying symbols. Impossible to get but Fire Horse can still produce some really big wins. The highest paying symbol in the game is the Fire Horse logo awarding 1,000 coins for 5 of them on the reels and that value grows with every extra symbol in the winning combinations. 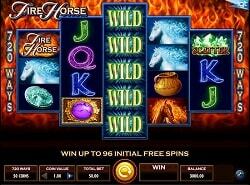 Fire Horse is one of the best video slot games we tried lately by IGT software. This game has been present in land based casinos for some time and it was no surprise that we saw an online version launched. Base play wins are random from small to medium and big. There is no way to predict if the game will pay or not. You can go for 50 spins with small wins and all of a sudden get 2-3 reels with wilds and a big win that boosts your balance. The bonus round comes fairly quickly when the game wants to pay. Winnings are almost always medium to big and retriggers happen often. Usually you start with a bigger number of free spins than 8 because there is always some extra bonus symbol in the triggering combination. We can definitely recommend this game for real play and especially to high roller players. Hitting a great bonus round with a few retriggers can award very big prizes especially if you are playing on a high bet size.